Having clients refer us to their friends is complimentary. Having clients use us a second time is humbling. While shifting into retirement, these repeat clients moved into a new Garden Lakes condo to begin the next phase of their lives. There was one problem: the kitchen was nothing like they were used to; closed off, dated, and not inviting at all. What was the solution? Eliminate the walls and merge the kitchen with the rest of the living area to create optimal space for these homeowners. The condo had a wonderfully large footprint that was not being utilized to optimum efficiency. Existing wood floors ran through most of the public areas of the condo and the clients wanted those to remain. Partitions separating the kitchen from both the dining area and living room had to go. In their place stood a moderate island that doubles as a breakfast space, and lots of negative space. This is a situation where less was certainly more. Knowing they were using modern accessories, the homeowners chose a modified shaker doorstyle painted in a soft white varnish. Topped with the watery blues subtly found in the quartz composite countertop, these transitional elements balance the stark modernity of the homeowner’s existing collection. The blues found in the countertop were the inspiration for the paint selection. The homeowners then added a bit of sparkle with an understated but contemporary glass tile backsplash. The existing wood floors adds to the transitional warmth of the clients’ new home. 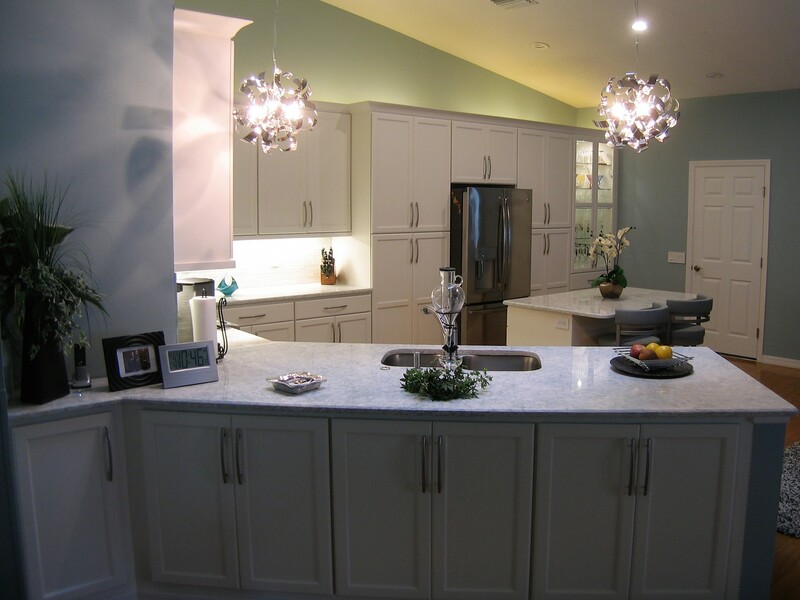 This entry was posted in Design and tagged Cambria, kitchen, remodel, StarMark, white. Bookmark the permalink. We really appreciated the speed our job was finished in except I didn’t get to eat out as much as I thought I would (ha). Thanks again for a kitchen that I am so proud of.